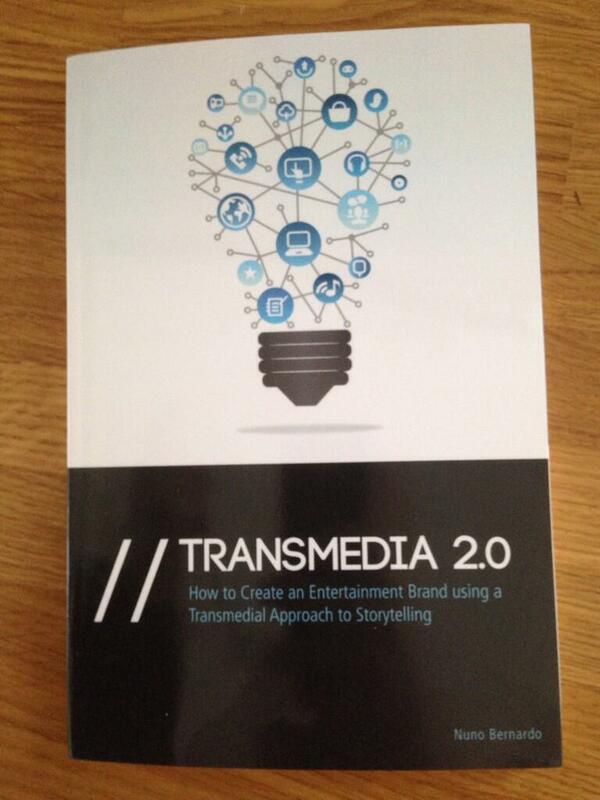 Nuno Bernardo has just released his second book on how to produce transmedia. Titled ”Transmedia 2.0 – How to Create an Entertainment Brand using a Transmedial Approach to Storytelling”, it’s an in-depth look at why transmedia storytelling methods can give creators and producers a decisive edge when it comes to standing out among the crowd and the chatter of today’s media world. I’ve always been a fan of Nuno’s way of approaching transmedia and production. I believe strongly in financial sustainability – that your content should be able to generate enough ROI for you to be able to make more content based on that. Nuno’s approach is even more forward – he’s proven time and time again that his company, BeActive, is great at creating an audience for projects and leveraging that audience to coax funding and sponsorships for the projects in question. In this book, he looks at a number of the projects BeActive have produced over the past couple of years. Looking at the different sections, it’s easy to see that this is a very hands-on book, aiming at encouraging and helping producers create more and better and more financially viable projects. The first chapter is about branding, the second about financing. The third talks about creating storyworlds, while the following ones are about planning a release, marketing and monetization. All in all, there are a lot of very practical and handy tips in this book. This book will help you do exactly that. If you’re looking into transmedia storytelling as a way to enhance your content and increase the audience’s engagement in your stories, you could do far worse than taking a look at this book. The past year has been a marvellous year for multiplatform storytelling. The reason is simple; there are a lot of platforms to create for and an ever-increasing amount of people using these platforms. Back in the days when, for instance, interactive television was the hot topic of the day, the great challenge was turning a sit-back audience into a lean-forward audience. This is no longer the case. The audience is already leaning very much forward. Not only that, they are leaning forward with a smartphone in one hand, a tablet on the table in front of them and the television turned on – but often largely ignored – in the corner. The challenge now is not to active the audience, but to offer them engaging and immersive content, a reason to interact and a meaningful direction in which to go. A great way of approaching the development of immersive and engaging properties is by using transmedia storytelling methods. But still, twenty odd years after professor Marsha Kinder coined the term, and close to a decade since the release of Henry Jenkin’s ”Convergence Culture”, transmedia remains an elusive concept. In a way ”transmedia” a bit like the Holy Grail; many a knight of the storytelling table have gone out into the world chasing it. Yet, precious few have touched it and lived to tell the tale – which in storytelling terms means having had their projects both declared successful and accepted widely as true transmedia. The debate around the term has been ongoing for years. As more fields and more industries acknowledge the strenghts of using storytelling to get messages through to target audiences, and as the fragmentation of the audience on the technological side becomes increasingly apparent, transmedia has become a term du jour in marketing, advertising, publishing and a number of other industries. Needless to say, not everyone looks at transmedia in the same way. Which way it is that ultimately will be decided on as the correct one remains to be seen. Meanwhile though, we can feast our eyes – and other senses – on marvellous projects that can fit under the transmedia umbrella. Only the past year has treated us to a multitude of awe-inspiring campaigns and projects. Ranging from the daring venture of Defiance to the innovative Lizzie Bennet Diaries, from the intriguing Fort McMoney to the downright sublime Body/Mind/Change, the examples have been legion. For the coming years, it’s hard to see any lessening of the pace. For me, an impressive creator and producer of projects in the transmedia vein is the author of this book. Nuno’s approaches to and executions of his projects – ranging from Sophia’s Diary and Final Punishment to Beat Girl and Collider – are a breath of fresh air, as well as cases to be thoroughly studied for future reference. I am going to read this book with great pleasure, as I did with Nuno’s last book. If you’re holding this in your hand right now, I believe you are about to do the same.